Pelham Humfrey (1647 – 14.07.1674) was an English composer and lutenist, who was particularly noted for his anthems and sacred solo songs. He was the first of a new generation of English composers at the beginning of the Restoration period to gain prominence. In 1672, he succeeded Henry Cooke as Master of the Children of the Chapel Royal, where one of his pupils was none other than Henry Purcell. 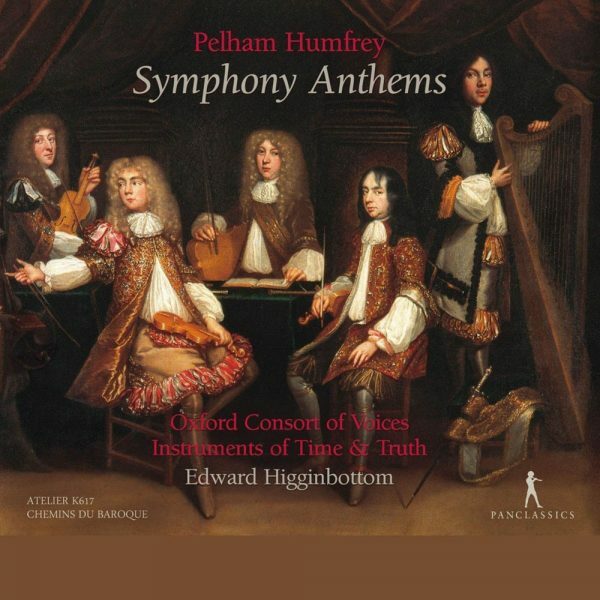 Humfrey’s compositions are peculiarly expressive and affecting as exemplified by the seven beautifully constructed anthems we get from Edward Higginbottom and his forces. They are surprisingly fine works mixing vocal solos and ensembles with string interludes. The space for which Humfrey conceived these anthems was modest: the royal chapel at Whitehall measured only 75 x 30 feet but this intimate ecclesiastical room was ideal for the declamatory style adopted by this interesting composer. These resplendent works clearly befit the court for which they were written. There is such poignancy and expressive power in the Verse Anthem O Lord my God (track 4) that one cannot help but wonder what works we might have inherited from Pelham Humfrey had he not met such an early death. Pan Classics are to be commended for providing the opportunity for Edward Higginbottom and his colleagues to put these anthems on disc. The acoustic of the Chapelle des Verriers, Vallerysthal, Moselle in France where this CD was recorded in July 2017 is well suited to the anthems and has been captured well by the sound engineers. There is a useful booklet giving background information on the works and performers as well as the text of each anthem in English, German and French. This intriguing release is our Collectors’ Choice for May 2018. Stream on Spotify or buy from Presto Classical.